With a trendy herringbone design and a 100-percent cotton construction, this blanket from Eddie Bauer is a great way to lend character and warmth to any room in your home. The design provides fresh texture and comes in a range of neutral tones that will blend seamlessly with your decor. Eddie Bauer Cotton Blanket is a well made, perfect size bed covering. VERY pleased with the quality. 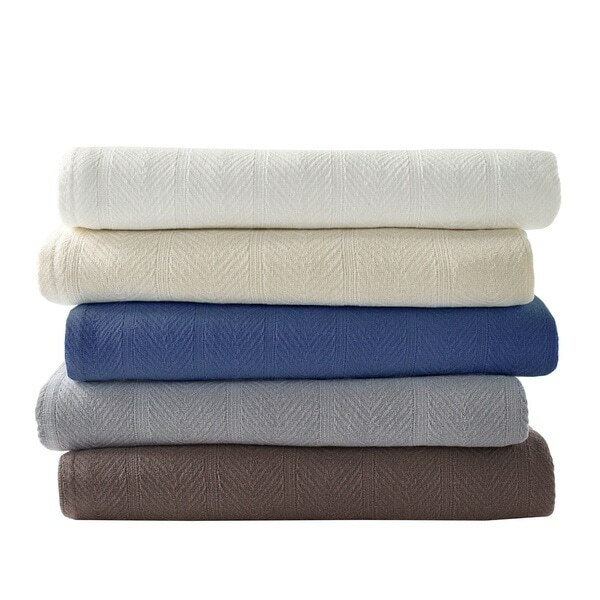 The Eddie Bauer Herringbone cotton blanket is just a shown, great blue color. The weight is perfect not too lightweight. I washed it and it looks great. I didn't measure it before washing. Great quality. This is a gorgeous blanket, soft, just the right weight, fits my bed perfectly. The only thing to watch out for is if you have a cat, it snags easily. First night on my bed and I had to cover it with another blanket because my cat has already snagged it everywhere with her claws. Really nice blanket, though. Great quality and a lovely weight for spring/summer. I’m a bedding snob & usually order only the best linen & cotton bedding from my favorite high-end sources. However, after trying at least 100 different white cotton blankets I’ve found this to be one of the best overall and therefore habe been ordering it for years Yes, it shrinks but thats to be expected of any 100% cotton fiber blanket BUT that process also tightens the weave, making it less susceptible to snags! The shrinkage is A LOT less than most cotton optiond & it still fits our King or Queen beds as long as its not subjected to excessive overheating in the dryer. It helps if the blanket is dried alone so other items aren’t tangled inside causing the blanket to be a shell that takes all the heat and contains wet bedding inside...this will cause cotton fiber damage. The weight is absolutely perfect for layering, the herringbone weave looks beautiful and provides just the right amount of texture, and it comes out of the dryer soft and fresh after any required bleaching or oxiclean washes. I use a King size version draped over our white slipcoveted sofa. The white matches the bull denim slipcover perfectly and protects it so I don’t have to wash the slipcover as frequently or worry about bleaching stains out. Being on our main sofa means it see’s a lot of abuse from plopping down, curing up, sleeping, etc. We’re a rough and tumble household, yet it holds up so well I still have the first one ever purchased! The weave is tighter than most cotton blankets so it usually holds up without issue for years before its looking dull and no amount of oxiclean or blueing will bring it back so I get a new one. First, what a great deal on an Eddie Bauer blanket! Next, I can't believe I got a pure cotton blanket that looks lovely, is large enough to tuck into the bottom of my Queen-sized bed, doesn't snag, and is the perfect weight for Summer. It's a big WIN! I will start off by saying the very first thing I do with all my new linens is to send them through a wash cycle. I wash new linens to see if they meet my expectations before deciding to keep them. Let's face it, you can determine a lot about the quality of a well made blanket if it makes it through the first washer and dryer cycle without piling, fading, and stringing. I was thrilled with this blanket after the first test and it exceeded my expectations! No piling, no fading, no stragggly strings at hem or corners and it looked just as new as it did when I unpackaged it. I purchased the gray blanket and it is a beautiful heather gray color. The detail of the herring bone is extremely articulate and could be used for display on a blanket rack, over a sofa back, or at the foot of a bed. The pictures do not show the detailed design very well but feel comfortable in knowing the design is impeccable. I purchased this blanket for use as a layer in between a sheet and comforter on my bed. It turns out to be the perfect weight, not too heavy as a layer, yet providing the warmth and comfort that I was searching for. I would recommend this blanket without hesitation. Eddie Bauer name is true to quality. Purchased two white/cream they are soft and are cozy on the twin beds. Great price and I hope to have at the cabin for years to come. I really like this blanket. I haven't had a chance to wash it yet, but just taking it out of the bag-thing it came in, gave me a chance to assess the blanket. It's a little stiff, but I'm pretty sure that's due to the tight weave. The blanket appears warm - it's July, so I'm not in any hurry to get under it, BUT I have two Chihuahuas, one being a 6 lb teacup Chihuahua. She is *always* cold. Even in 75* sunshine. The reason I haven't washed it yet is because as soon as I took it out of the packaging, my dog curled up in the blanket - and has been there all day. When my other (big) Chihuahua found out he was missing something, he curled under the blanket, too. They have been snoozing in it all afternoon. I would share a picture, but there's no way to do that in these reviews. Anyway, no one's nails have pulled any of the threads, which is a small miracle. I will wash the blanket tomorrow so I can put it in the linen closet...that is, IF I can ever get the pups to vacate the beautifully-colored covers. The "vintage blue" color is wonderful - kind of a turquoise/teal color. It would go with limitless interiors. I will probably buy another one before winter sets in - but it's too warm to think about that right now. Besides, I may have to order two more...I don't know if I'm going to be able to get my pooches out of this one yet! I loved to the color of the blanket. It matched my decor perfectly. However, the quality was lacking. I expected more from the Eddie Bauer brand. The blanket was very thin and did not hold up well to washings. Very nice purchase for the money. Eddie Bauer delivers quality goods you can always count on. I ordered one of these blankets and it had about 4-5 big snags in it, as well as torn threads. I exchanged it for an exact replacement, and the replacement had snags and holes in it too. I think it's a defective lot that they are trying to get rid of. Too bad, because the color and weave and size were all lovely. Bought this blanket to take on vacation but it is getting lint everywhere. I have washed it a couple times but doesn't seem to help. Made a huge mess in my washer/dryer. Will most likely give it to the dog. Great Blanket, heavy and soft. Keeps you warm but still breathable. Bought Kingsize, would buy again if price went down a little. I purchased this blanket to use for the summer - my duvet is quite heavy, and just a sheet wasn't enough. This blanket is the perfect weight for us. I have only washed it twice so far, so I can't comment on the durability, but so far, so good. My only (minor) gripe is that I wish it were a bit larger - we have a queen bed and the blanket is full/queen size. it hangs over the sides a decent amount, but I wish it was a bit longer to securely tuck under the foot of the mattress. It wouldn't stop me from purchasing it again, though, and I may buy one for our full size guest bed. Good value. It's is lighter than I expected. Even after probably 20 washes, this blanket is still rough and sheds a little. Not soft. Not cozy. Not nice on your skin. Definitely not your go-to cozy blanky. Blanket good weight for warmer weather. When I ordered the color was limited to gray. I would have preferred another color. Good item for the price. Comfortable, lightweight blankets. Just what I wanted. They do tend to snag as woven cotton blankets are prone to do. I keep that remedied by covering them at all times with a bedspread. No kitties allowed on them. Beautiful. Great wight and drape. Very nice quality. Good weight for use in summer and fall seasons to stay warm but not too warm. I chose this blanket because the stitching was tighter than other options I've seen. I didn't want the blanket to snag and pull threads. I'm very happy with it. Exactly the lightweight warmth we needed. Soft, well made and perfect for layering or by itself. This blanket is quite warm, and the pattern is very nice. "In the photo of a stack of five blankets, what is the name of the color of the one next to the top? To my eye (and monitor) it's sort of a light gold." It is more like a khaki color. color is called, "bone," which is beige in color. "Is the mushroom color closer to brown or gray?" Hello Mick, the mushroom color is more Brown. Please let us know if you have any further questions. it is more brown, that is true, but it edges very slighty on purple. "what is the name of the teal color? There is a picture of the teal color and a grey/blue color both with the name "vintage blue."" Hello Togo, the teal color shown is called "vintage blue" The lighter blue color is called "blue smoke". Thank you for shopping with us! "Is vintage blue a teal color?" Hello feather88, vintage blue is a greyish blue. Have a great day! "What are the dimensions of the full/queen blankets?" Hello fransisson, the full/queen is approximately 90" inches wide x 90" inches long. Please let us know if you have additional questions. Thanks for shopping with us. I wanted a light cotton blanket for Spring and Summer use. "How heavy (in ounces) is this blanket in a) twin, b) king sizes? Is it pre-shrunked?" Thank you for contacting us blankyboo. 325 grams comes in Twin, Full/Queen and King, it is pre-shrunk. Please let us know if you have any further questions.